If a war were to start today, the govt will immediately mobilise our NSmen in the country’s defence, I have no doubt about that. NSmen will be reminded of their pledge to protect the nation and no doubt the PM and his cabinet will go whole hog on national TV to remind NSmen that they would be defending not only the country but their loved ones and remind them of the consequences should the enemy were to overrun this place. 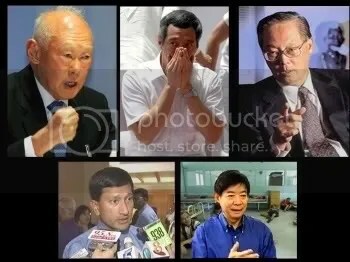 But when there is a crisis such as the present when thousands of Singaporeans watch helplessly as their life savings are going to literally disappeared into thin air THE SILENCE OF THE PM AND HIS CABINET IS VERY VERY DEAFENING AND TELLING INDEED! What has happened to all those theories about social, economic, military and psychological defence under the oft-repeated TOTAL DEFENCE concept promulgated by the govt? Are they all merely theories? Intended merely as propaganda to keep Singaporeans in line only? Bhutan has a yardstick for measuring success which some youth here yearn to have in place of Singapore’s relentless pursuit of economic growth. It was a longing that struck a chord in Prime Minister Lee Hsien Loong yesterday, but he was quick to explain why Bhutan’s Gross National Happiness index was not suitable for Singapore. ‘We are one small island in the middle of a very turbulent South-east Asia. You have to watch your GDP (gross domestic product), because if you are poor, you will be weak; if you are weak, something will happen to you,’ he said.